We woke at 3:30 to the sound of our porters, “knocking” on the tent. 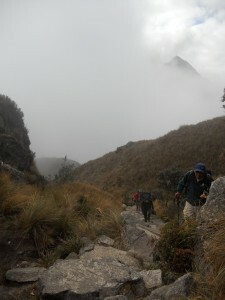 “Coca tea, coca tea…” Handed through the rain fly and sleepily consumed, the tea woke us and prepared us for the climb ahead. 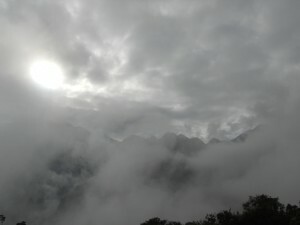 An hour later, we were running down the ancient Inka Trail, racing the sun on its path to the horizon. 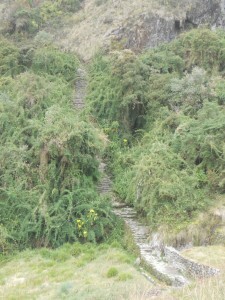 Our goal was the Sun Gate, as we ran in the dark, 30lb pack, headlamp, trekking poles and a 1,000 foot drop to one side. “I think I need more adventure racing in my life,” I thought to myself, a grin and a cackle rising to my mouth. We’d spent the day before running down the 2,000+ steps from Deadwoman’s Pass. LeAnna and I were convinced now that it was easier than walking. 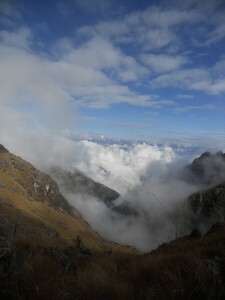 From a perch high in the Andes, looking out over the cloud forest, we surveyed what lay ahead of us. We’d climbed to a point that was undeniably sacred. The mist washed over the place, muffling voices, disorienting, transporting. We stayed a short time, climbing as high as we could. We sat in silence, taking in the peaks that surrounded us; breathing in the strength of the ancient mountains. When we departed, it was quietly, leaving a small offering. Once off the peak, we found ourselves in another world. 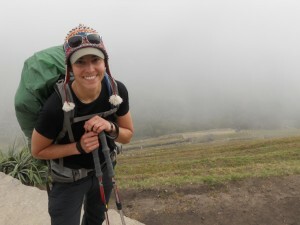 Our surroundings changed from the high-steppe of the cloud forest to the damp, lush overgrowth of the rain forest, marked abruptly as the path dipped below the canopy before us. Always we were walking down. 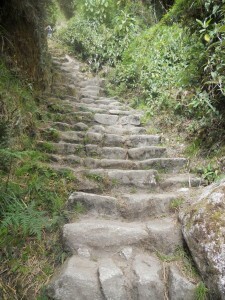 Down the sloping path, down the stone steps, down, down, down we trotted, undoing the work we’d done the day before. 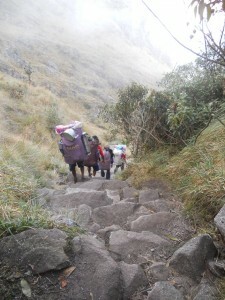 We stepped aside when we heard the padding of feet, and “porters” gently called to us. In their sandals made of recycled tires, showing dry, calloused heels and blackened nails, the porters had an amazing mastery of the trail. Muscled calves bulged under the weight of impossible loads: canvas sacks fitted with shoulder straps and stacked high with tents and camp chairs, gas tanks and burners, cookware and tarps. Most bags were as tall as their porters, and always wider. The men often ran with their hands behind them, supporting the underside of their packs, waist belts ignored and hanging uselessly. On this third day of our trek, we were feeling good. We looked at each other and, instead of hanging back like we had for two days, we fell in line behind a group of the small, weathered men. It’s a marvelous thing to find yourself traveling with a companion who shares your sensibilities. 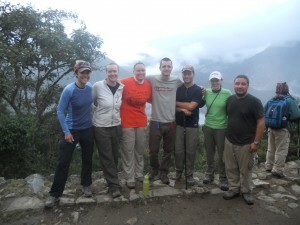 Without a word, we decided to see if we could hang with these porters. And so we ran, indelicately down the path. It must have startled at least one of the porters. Hearing our scuffling, he stood aside for us to pass, a bemused look on his face. “No, no!” We waved our arms at him, beckoning him on in front of us. It was one thing to run behind the porters, but quite another to run in front of them. So we stayed behind, watching as they slid around hairpin turns and cut off the trail to take nearly invisible shortcuts. For two hours, we ran. We kept the porters within earshot nearly the entire time. Only in the last 10 minutes before camp were we passed by others. We felt good. We celebrated as we came around the corner and saw the green and yellow of our porters’ food tent, and the surprised looks on their faces. The surprise turned to smiles as they clapped for us. And then they set to work. We were indeed a surprise. The sleeping tents weren’t yet set, and the food was far from ready. These guys had only just arrived before we had. Guilt joined our emotions as we watched them scramble to set camp – something they clearly hadn’t planned on having to do for a while. We slept early and hard that night, knowing the ungodly hour at which we’d be expected to rise. But not before we’d gone through an elaborate ceremony designed specifically to allow us to tip our new friends. Francisco, their spokesman and shaman spoke to us, calling us “brother” and “sister” and talking of the connection that all of us share. For our part, we thanked them in Spanish, as well as we could. I thanked them for everything, “todo,” which was heard as “toro,” or bull. One of many misunderstandings…and then we tipped each of them according to their job description from a pool of money we had all gathered together – an attempt to say thank you for the backbreaking work they did, and the cultural heritage they shared with us. Day 4 had started at 3:30 a.m. for a couple of reasons. We had to hike half a mile up the trail to wait at the last checkpoint with the hundreds of other trekkers who wanted to make the Sun Gate before sunrise. It meant sitting at the checkpoint for an hour and a half, but it also meant having relatively few people in front of us on the trail. The other reason was to allow the porters to run the 90 minutes down to their 6 a.m. train that would take them back home. They would be leaving us to go on to Machu Picchu alone. I asked Odon how many of the porters had ever seen the sacred site. “None of them.” Our guide seemed amused by the question. 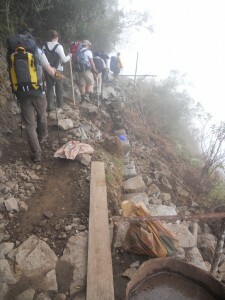 It cost money to see the site, and the porters had to catch the train back far too early to allow them to venture on. Odon had spent years as a porter, running the trail 4 times a week. After years studying “hospitality services,” he was now a guide. He wore hiking boots and carried only a small pack with his personal items. He would be entering Machu Picchu as our guide. The other Peruvians would be running with all of their might to catch a train so that they could prepare for the next day’s brutal return to the trail. It’s a humbling thing to realize your privilege. To sit in the mud, having paid for the opportunity to do so. Waiting to see the cultural heritage of a people that carried my food so that I could see something that they never would – the sites created by their ancestors. Dressed in the freshest clothes we had, we marinated in our adrenaline, willing the checkpoint to open. When it did, we found ourselves in an adventure park setting. Something between Disneyland and Jurassic Park surrounded us. One misstep could seriously send us hurtling down hundreds of feet of drop-off. There were only a couple dozen trekkers in front of us. 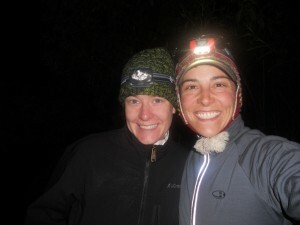 LeAnna and I had angled to the front of our group, eager to continue our running of the trail. But this section was narrow, and didn’t provide much opportunity for passing. Eventually, we made it to the front, moving past people who stopped to tie shoes or drink water. We were possessed. Only once did we stop – to remove layers rendered unnecessary by our running. Neither of us wanted to find ourselves sweating and chilled in the early morning cold. While we stripped with lightning speed, one small group of two passed us. We swore under our breath and redoubled our efforts. We knew we were close, but we didn’t realize just how close. The Sun Gate was at the top of the “ladder,” a series of steep steps. As soon as we resumed our jog, we hit them. And then we were there. At the Sun Gate. With almost nobody around, we surveyed the view. It was cloudy. There would be no sunrise for us. But it made no real difference. 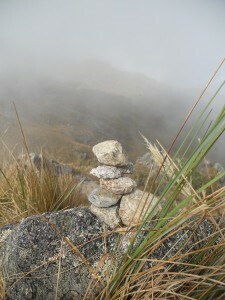 We stood at the top and looked through the mist at the bits and pieces of landscape that were revealed. The rest of our group materialized, and we posed for our second mandatory group shot. One more hike, and we’d be at our destination – a place that had eluded Spanish conquests. A place that is still not completely understood. A place secret, and sacred and hidden. 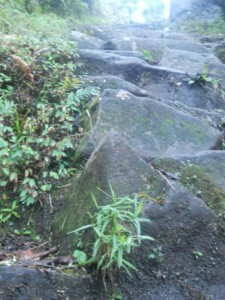 The trail led on, past sacred rocks and through parts that had been washed out by mudslides. The closer we got, the reasons it had remained secret became more and more clear. 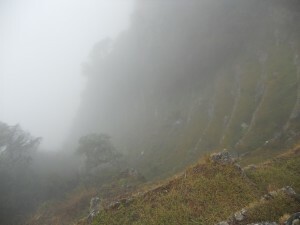 The enormous site of Machu Picchu lay hidden in the mist. It was right in front of us, and we had almost no indication that it existed. “Secret and sacred,” Odon had intoned. As we watched the swirling mists, we began to see.